You will need MS PowerPoint or similar on your device. 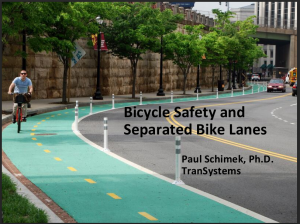 The push for “safer” bikeways is accelerating as city and county agencies, and Caltransplan new Class 4 facilities on existing roadways. Class 4 was created last year, defining how both one- and two-way cycletracks may be installed, how roadway space now allocated for both auto and bicycle traffic may be redefined and segregated for bicycles only. This may sound like a good thing. But what are the pitfalls? Dr. Paul Schimek of TranSystems presented the following analysis of Massachusetts’ facilities and the dangers bicyclists face everyday. Be sure to read his presentation notes to understand the difference between safer looking, and actually safer.